A wooden play kitchen can provide hours and hours of fun for your little one and their friends. Not only will it provide entertainment, it will help your child develop motor skills and also enhance their creativity. Their team and bonding skills will develop as well. Moreover, cooking is a life skill and it is never too early to start! To help you choose only from the best wooden play kitchens out there, we will now give you buying tips that will help you smartly narrow down your choice. Ideally, you must choose a play kitchen that uses real wood. These tend to be more expensive than the composite wood or plastic variety but they will last a lot longer. You must remember that kids don’t know the concept of being gentle with toys and they are going to bang and beat things up a little. Good quality wood will easily hold up. After choosing a play kitchen with good wood, you must also ensure that the paint used on the wood if lead free, toxic free and also of good quality, not chipping or rubbing off with wear and tear. It is always safer to buy a wooden play kitchen that is slightly taller for your kid rather than buying one that is too short. Remember, kids can spurt a few inches of growth all of a sudden and the last thing you want is a kitchen that will be too small, too soon. Most wooden play kitchens are about 30 to 40 inches tall, about 10-18 inches deep and about 30 to 40 inches wide. Before choosing any wooden play kitchen, please make sure that the size and dimensions will be a good fit for your kid. Another good idea about buying a kitchen with a compatible size is to buy a kitchen that will come with screw-off legs. The kitchen can first be used without the legs and you can add them on when your kid gets taller. Of course, it is also very important that you ensure that the play kitchen will fit comfortably in a play room. After all, kids love space as much as you do in your own kitchen! Kids love to play pretend when they host their friends for dinners or lunch or even snacks. A working kitchen with functional parts will make the experience all the more interesting and engaging. Look for kitchens that have gas burner dials that turn and make an audible click, just like how they do in your real kitchen. Other essential parts you must look for are doors that open and close with a good latching mechanism, a microwave and oven with a clear glass front door and a sink with a faucet that can be moved around. The kitchen must also obviously have a refrigerator with working doors. Some of the good manufacturers even equip the refrigerators with ice dispensers and ice trays in the freezer section. Some of the most well thought out play kitchens will even have a working turntable inside of the microwave. Similarly, the oven must have removable trays so the kids can pretend that they baked something awesome as they pull it out and serve it up to their friends. Some other bonus features that will be nice to have in a play kitchen are a cordless phone hooked to one of the cabinets, a cutting board, a wooden knife and a sink that can be removed. The phone is actually a great source of entertainment for kids who are playing at the kitchen by themselves. You will love how they pick up the phone and babble before going back to their cooking duties. Some kitchens also come with battery powered lights and sounds. For example, placing a cup in the ice dispenser of the refrigerator will create a noise that resembles a lot of ice cubes being shaken up. A removable sink is actually a pretty important feature you must look for as kids will pretend to wash dishes and glasses in the sink, actually spilling foods like fruits or juices. Being able to remove the sink will mean that cleanup is easy as you can take it away to an adult sized sink, for your convenience! It has now become common to include a washer and even a washer-dryer combo in a wooden play kitchen. It mixes things up a little and kids can pretend to be mommy and daddy trying to clean up their clothes, when they are too bored with cooking. Only buy wooden play kitchens that come with an assembly guide. More specifically, you must look for an assembly guide that will give you picturized instructions on how to put the parts together. If you are not very handy with assembling furniture, a large play kitchen can even take 2-3 hours to assemble, if the instructions aren’t very clear. Look through the product descriptions to read about how the manufacturer of the play kitchen provides you with assembly instructions. It always helps to have someone help you assemble the play kitchen when you do order one. Once your kids begin to use the play kitchen to play, they are going to want to use plates, cups, salad kits, baking kits, waffle kits and number of other things that interest them. Wouldn’t it be fantastic if you could store away all these little knickknacks inside of the play kitchen itself? This is why you must look for play kitchens with good storage space. Now that you know what you can look forward to in the best wooden play kitchens out there, it is time to begin your shopping. 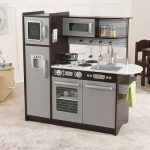 Here are some of the most popular wooden play kitchen models out there, giving you great features along with fantastic value for money. Click on pictures to check price and availability! Comes in 5 different colors with working knobs and doors. Includes a cordless phone and a removable sink. 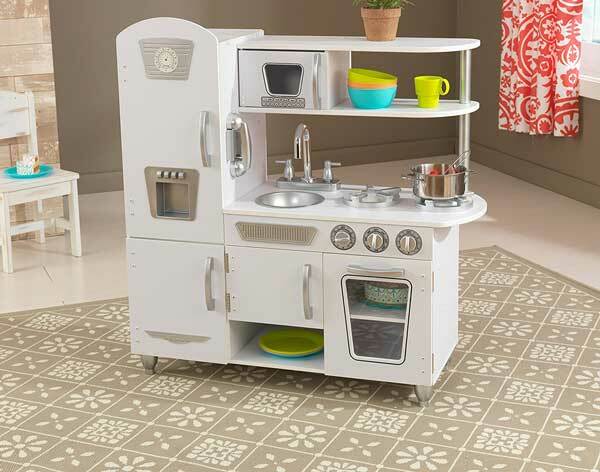 One of the best toddler kitchen set and one of the safest. Comes in a brown/white color scheme and includes a speckled granite finish-like counter top, ice maker with light and sound and a lot of storage space. 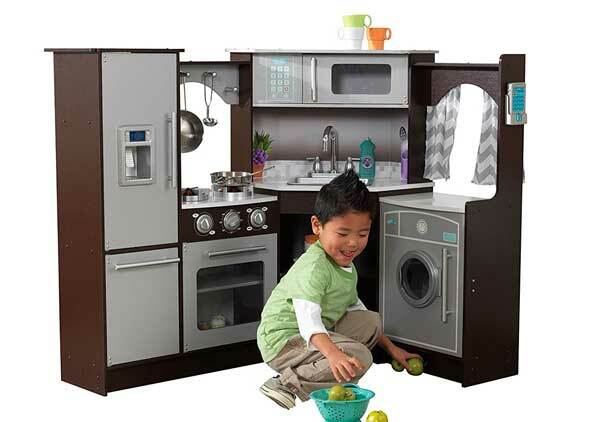 This play kitchen also includes a laundry washer with a working door. 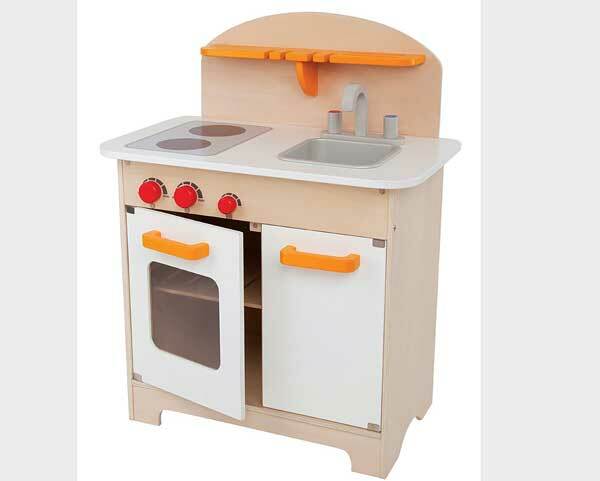 A very compact toddler kitchen with big red gas burner knobs that turn and click. 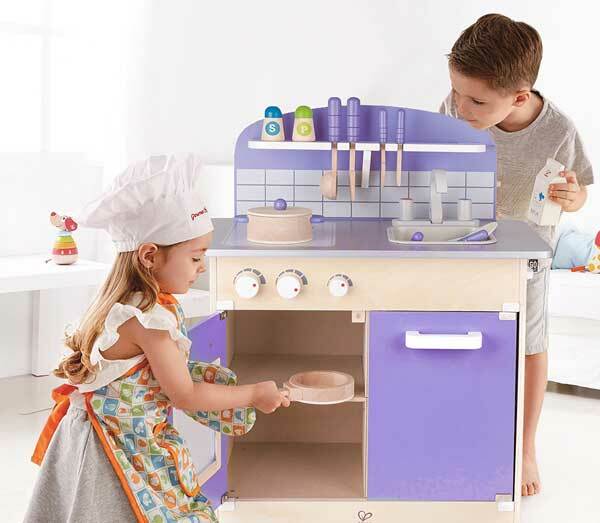 A great toy kitchen set built with safe materials and very attractive. Though not a full kitchen, this Hape model gives you an oven, a stove top, sink and a lot of accessories like forks, spoon, mixing spoon, spatula, plates and even salt and pepper shakers. A fantastic choice if you only have a small play area. Large play kitchen for many kids to play around at. A refrigerator with a realistic chalkboard freezer finish. Lots of storage space and a modern countertop design. A fairly large kitchen with dimensions of 42.5 x 17.1 x 41 inches. We wrote a full review for this toy kitchen here and we think it might be one of the best toy kitchen available today.